Figure S1. 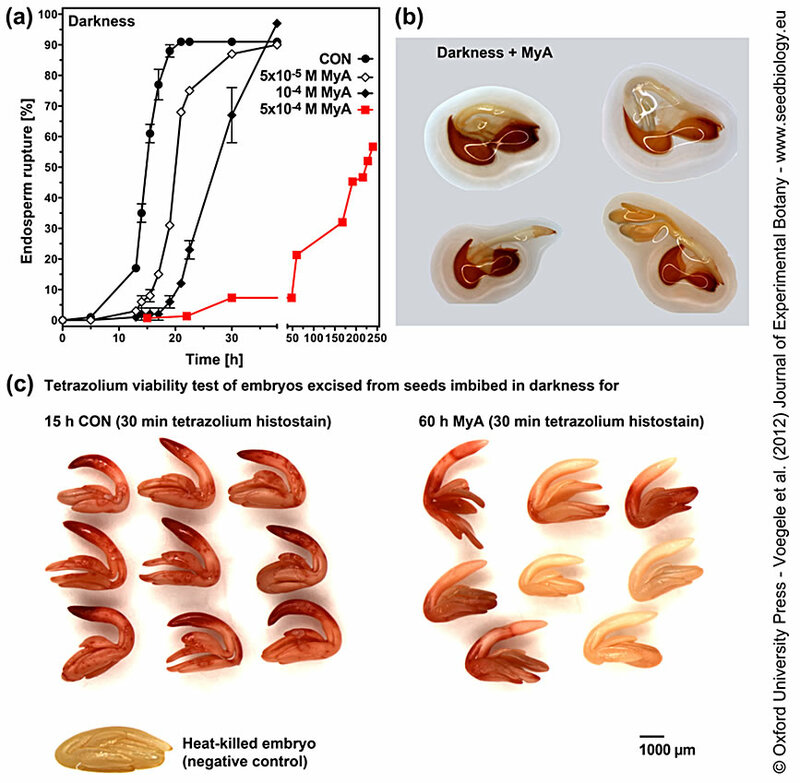 The effect of myrigalone A (MyA) on the germination of Lepidium sativum seeds imbibed in darkness. (a) Germination kinetics of CON and seeds treated with different MyA concentrations. The times to 50% endosperm rupture are 14.9±0.1 h, 20.0±0.0 h, 27.2±1.1 h, and 223.0±2.3 h for CON, 5x10-5 M MyA, 10-4 M MyA, and 5x10-4 M MyA, respectively. (b) Atypical germination of seeds incubated in the presence of MyA in darkness. (c) Tetrazolium viability assay of embryos from seeds incubated in darkness. Embryos were excised from seeds prior to endosperm rupture and incubated in tetrazolium solution for 30 min. CON = 0.35% (v/v) methanol.